Colorful lines and faces make up a fragment of ordinary objects. They are just lines and faces, but the viewers immediately relate the image to objects they know. 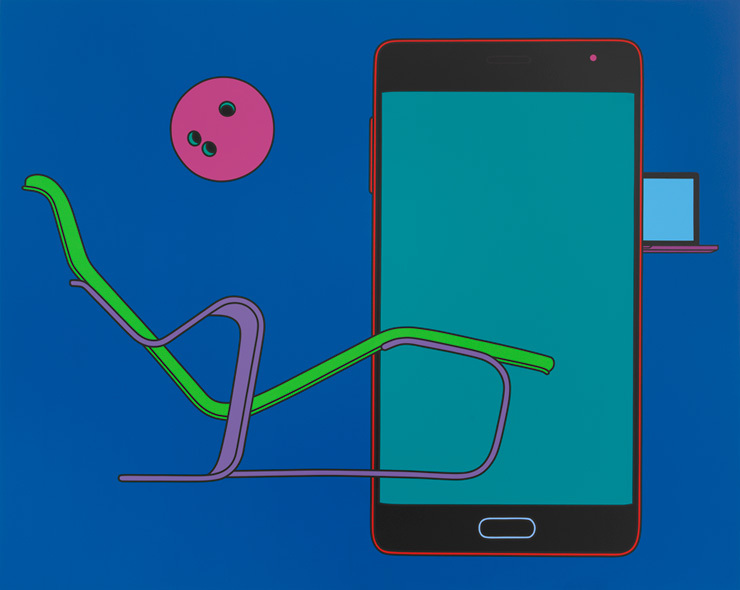 Irish-British artist Michael Craig-Martin, known for his conceptual works, said he never draws anything not immediately recognizable. The artist's major works are on display at his solo exhibition "All in All" at Seoul's Gallery Hyundai through Nov. 5. The exhibit features 30 of Craig-Martin's colorful paintings depicting familiar objects such as a book, a light bulb and a trainer. The pool of subject matter expands to more up-to-date gadgets such as a mobile phone or a memory stick. Some of the objects are seen from the front, while others are seen from the side, creating an effect of passing through the canvas. However, they are all easily identifiable. The mass-produced objects are found all over the world and thus Craig-Martin's works resonate with people across the globe. "I'm trying to find all the lines necessary to understand the objects. I'm not a cartoonist so I don't abbreviate or generalize objects," the 76-year-old artist said. "It is amazing that I give you so little, but you understand so much." In fact, there are no sunglasses, but just colors and lines on a canvas, not scaled right. "But you fill in the part I left out and you know what the object is for. I just trigger this information through an image and everybody comes with a lot of information. "I draw an object as simple as possible, but the message is as complicated as possible. Complexity happens in conception. It's not a puzzle and there is no secret or hidden message. I just draw something to stimulate your imagination." In his early works, Craig-Martin depicted real objects, but he soon realized the limitations. "There are very limited things to do with objects because you lose certain imagination. Images are much easier to manipulate," the artist said. "However, I don't draw objects. I just take what is there and create images." 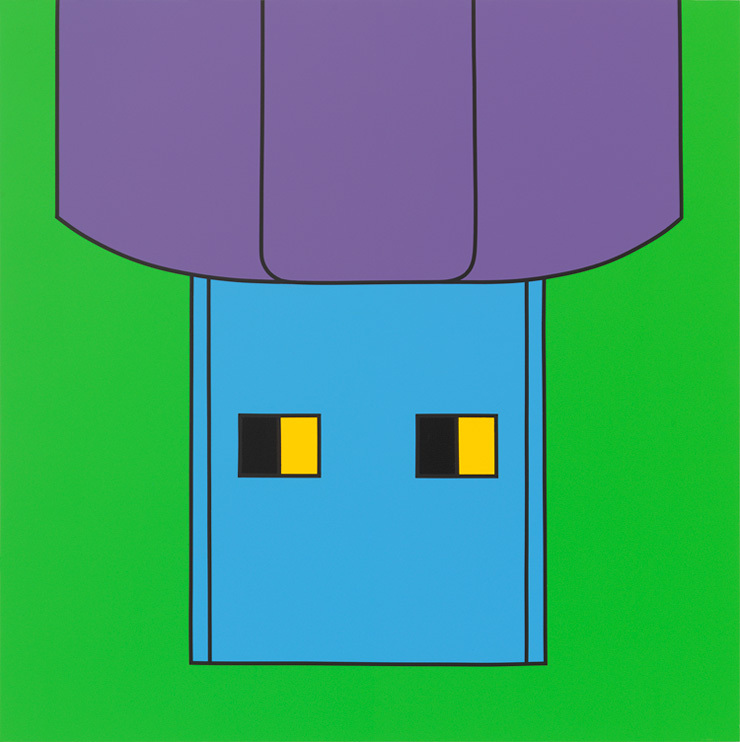 Unlike many contemporary artists who mix their own colors, Craig-Martin sticks to basic, simple ones. "I work in the world of images and color gives possibility to the image," he said. "I just use ordinary colors, not mix them up. I use objects with names and colors with names ― such as yellow, blue and red. It's a surprising thing that I'm the only one using the basic palette." Most of Craig-Martin's works are large in size, over two meters wide or high. The artist said the scale of the works in relation to the viewers is important to him. "When my works are reproduced, they tend to be seen as graphic designs because reproduction takes away the physicality of the artworks, which is an important aspect," Craig-Martin said. Craig-Martin also occupies a prominent place in the emergence of the Young British Artists (YBAs) of the 1990s. He was a tutor at the department of art at Goldsmiths College and had an influence with the YBA generation, including Damien Hirst. "I discovered my artistic language in my 50s. However, they discovered their own at much earlier ages," he said. For more information, visit www.galleryhyundai.com or call 02-2287-3500.